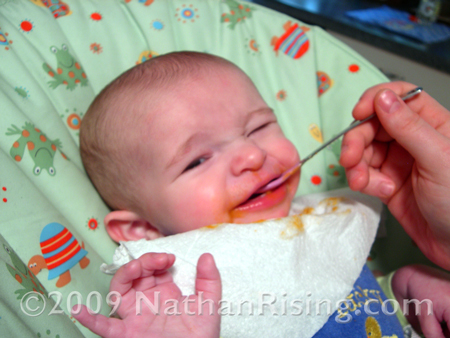 As you probably know by now, we’ve introduced solids into Nathan’s diet, and it’s been quite a journey already. We’ve enjoyed watching the expressions on his face when he tastes a new food (such as applesauce) and laughed at the bleating noises he makes when he likes something. As of right now, he has quite the pallet and likes all the foods we have offered him with the exception of sweet peas. Don’t even get me started on the sweet peas. Holy crap, you’d think I was trying to kill the poor fellow just by simply offering him the sweet peas. Offering them! Not forcing him to consume them… but simply putting them on a spoon after he’s tasted the first bite. He loves all the other foods we’ve offered. Maybe not the first time we offered them, but after the second or third time, he starts to like them. Especially prunes. He gobbles them up, bleating loudly to let me know that I’m not feeding him fast enough. He also loves bananas, pears, squash, and sweet potatoes to name a few. He was undecided on the peaches… one feeding he tolerated them, but the next he decided they were unworthy and spit them out, looking like me like I had lost my mind for daring to think he would eat such a substance. He detests having his face wiped after his meals. Hates it. With passion to be reckoned with. I’m enjoying watching his willingness to try new foods. It’s neat watching his tastes evolve and I am happy that so far, he likes mostly everything … I know this phase won’t last long!